ALMOST 3,000 young children in Zimbabwe are facing starvation as El Niño — and failures by President Mugabe’s government — are conspiring to create one of the worst famines for decades. A report released by the vulnerability assessment committee, the country’s famine-watch organisation, says the children affected – all aged five or under – were already suffering from “moderate acute malnutrition”. Save the Children UK has warned that the figure is likely to be higher because not all those affected have been included in the statistics. Last week local health officials told Tanya Steele, the organisation’s interim chief executive, that some mothers in the remote northern district of Binga were going without food for up to five days. In other cases, the women had to rely on wild berries and grasses to survive. About two-thirds of the country is expected to experience a food “crisis” until September, and that figure is forecast to climb to three-quarters from October. 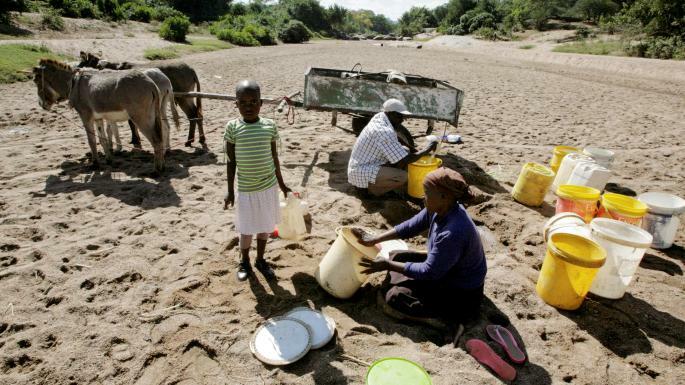 Most of southern Africa is expected to be severely affected by El Niño in the coming months, but in Zimbabwe the situation has been worsened by a complex range of failures for which President Mugabe and his government are held responsible. Famine relief officials said that the government should have declared a national state of emergency by December last year so that relief agencies could have mobilised shipments of grain to be brought in. However, the declaration came only in February, subsequently delaying famine relief plans. Sources say the government had been waiting for Mr Mugabe to return from holiday to make the announcement. Even if food were available, access would be seriously restricted due to a shortage of banknotes since April. As a result, the supply to the rural poor of regular remittances of cash from spouses working in urban areas has fallen sharply. Also, street traders – a major proportion of the population who recently became jobless after the closure of businesses – have seen their earnings plummet. The more affluent in society rely on debit and credit cards, but this is not an option for many who don’t even have bank accounts. Harvests are expected to be very poor next year, due to the low rainfall but also caused in part by the shortage of cash to buy seeds and fertiliser and basic farming supplies.